That has changed. A new state law, SB 1421 allows access to police records involving dishonesty, sexual assault and use of force. Now KPCC/LAist is joining with more than 30 newsrooms across the state, to share both Public Records Act requests and the files we get in response. Partners have received at least some records back from 134 agencies. Our friends up at KQED in San Francisco — the NPR station there — called late last year to ask if we'd be interested in joining them in collaborating on these police records requests. It started out as just a handful of public radio newsrooms and then we realized: Why stop there? Editors and reporters at the L.A. Times were interested and, from there, we continued to reach out to other newsrooms across the state. It's important to keep in mind that these kinds of police records were not always so opaque. L.A. used to televise public inquests into use of force by the LAPD, the last inquest was in 1981. And then more recently you could still get access to Sheriff's Department disciplinary records if a deputy appealed a decision. That was shut down by a 6-1 California Supreme Court ruling in 2006 that found the public did not have the right to access discipline records that were filed as part of an appeal, unless the officer waived his or her right to privacy. As that California Supreme Court ruling underscored, over the years many police unions successfully lobbied lawmakers and/or fought in court to expand privacy protections for sworn officers. That put most records involving internal discipline out of public view. And as Annie Gilbertson reports in in our podcast, Repeat, California became one of the most difficult states for journalists and the public to get access to records. Keep in mind — that fight is still going on now. Many police unions have gone to court to argue records that predate the law going to effect January 1, should not be made public. They argue it's unfair to change the rules on their members. The Downey Police Officer's Association has argued that older police records should be destroyed, in keeping with the city's policy of retaining records for five years. KPCC/LAist and the Los Angeles Times opposed the unions' attempts in L.A. and O.C. winning decisions in both Los Angeles and Orange County Superior Courts. And KPCC/LAist is seeking to intervene in the Downey case. WHO HAS SIGNED ON TO THE STATEWIDE COLLABORATION? Knowing there was this real sea change coming when it came to access to these records, California journalists started to think about what it would take to actually acquire those documents and then report on what they told us about patterns in police behavior. DON'T THESE NEWSROOMS USUALLY COMPETE? WHY WORK TOGETHER NOW? When the newsrooms started talking to each other, we started thinking about how how much more comprehensive our reporting could be if we share what we got openly across the state. And, as one editor pointed out: These are PUBLIC records after all. It was a little bit of an evolution to be honest. Journalists are by nature very competitive — we are definitely arm-around-our-food kind of people, so it was interesting to see how that thinking changed as we talked more. Jack Leonard — the L.A. Times Metro Investigative Editor — had one of the real "ah-ha" moments when we were talking about what we wanted to accomplish. "It struck me when I was talking to an old rival at the Orange County Register, and we were talking about how these records had been kept hidden for more than 40 years." Leonard said, "and we were saying this was a real opportunity for us to explain to Californians what kind of misconduct was going on and how police departments react to shootings deadly force and other serious incidents." It's unique in California. We're unaware of any collaboration spanning so many newsrooms in the state. That said, we know collaborations can produce some powerful journalism like the Paradise Papers and the Panama Papers. We thought it was important to colloborate now because many newsrooms in the U.S. — and here in California — have been shrinking at a pretty steady rate. That means fewer resources are devoted to accountability journalism. We are fortunate here in the KPCC/LAist newsroom because we have been able to continue to grow and invest in journalism with support from our listeners and readers. WHY DID YOUR NEWSROOM TAKE A LEADERSHIP ROLE IN BRINGING ORGANIZATIONS TOGETHER? 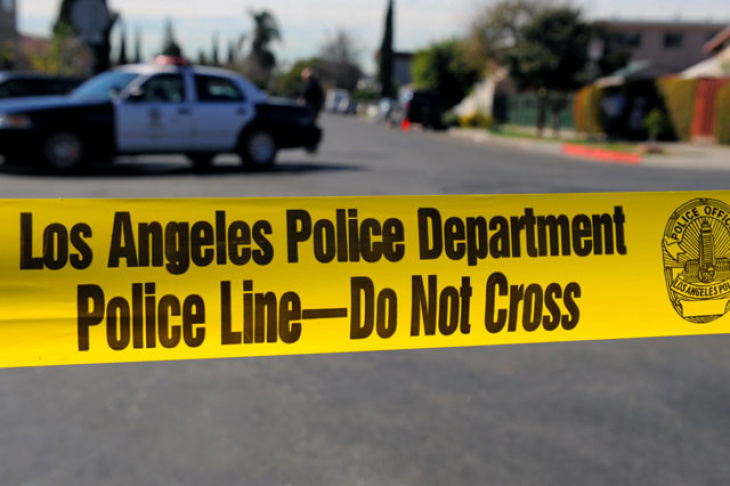 KPCC, which owns and operates LAist, has sought to hold law enforcement accountable. Reporters here have done painstaking reporting to investigate police killings in L.A. County. Our series, Officer Involved, tracker 375 police killings between Jan. 1, 2010 and Dec. 31, 2014 and found one in four people killed by an officer was unarmed. Until December of last year, when a sheriff's deputy in Cerritos was charged with voluntary manslaughter for shooting an unarmed man, an officer in L.A. County hadn't been charged in a shooting since 2000. We thought it was important to really look at those cases — to the best of our ability at the time — to understand why. A follow-up series analyzed more than 100 police shootings in San Bernardino County. 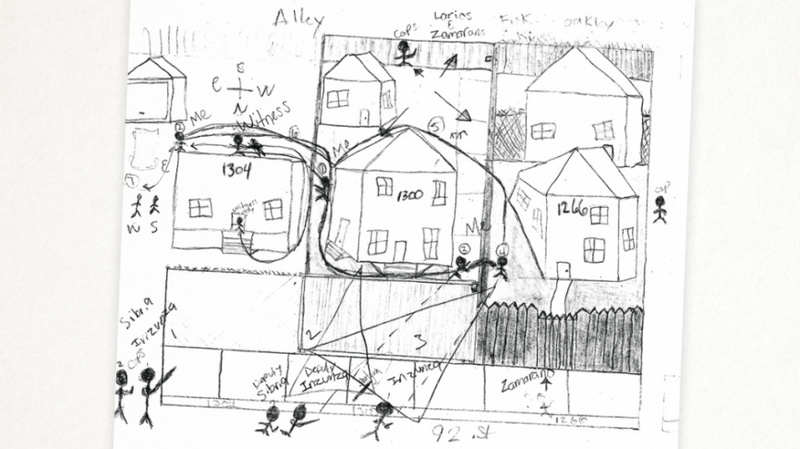 Tennell Billups' illustration of the events the morning Los Angeles County Sheriff's Deputy Gonzalo Inzunza shot him. And last year, our Repeat pocast went deep into L.A. County sheriff's deputies who had multiple shootings on their record. Most law enforcement officers go their entire career without ever shooting at another person on duty. Host Annie Gilbertson found that one deputy, Gonzalo Inzunza, shot at four people in seven months — which stood out in KPCC's analysis of police shootings as an unusual cluster. Each shooting was justified by officials and each time Inzunza said he feared for his life. Three of the people claim Deputy Inzunza had no provocation or lied to justify his shootings. Ultimately, because the records into the shootings were kept from public view under the law at the time, it was very difficult to get to determine how thoroughly allegations about Inzunza were investigated. And yes, now that additional records are available, we are digging in again. March 20, 10 a.m.: This article was updated with additional information about KPCC's past work on police use of force. This article was originally published on March 19 at 7:15 a.m.